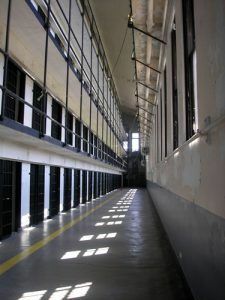 Almost from the beginning, the prison was deemed inadequate and overcrowded, a condition that would result in slow, but continual construction at the prison for the next fifty years. 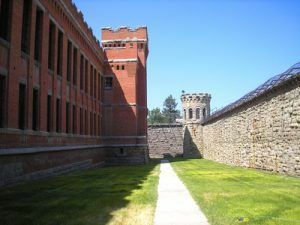 When Montana became the forty-first state on November 8, 1889, the prison became Montana’s responsibility. Finding it expensive to operate, the Board of Prison Commissioners contracted out the entire Prison operation in 1890. Colonel Thomas McTague and Frank Conley of Deer Lodge received the contract, which paid them seventy cents per prisoner per day. As a further measure to reduce crowding, he put the prisoners to work, which generated income from the prison; and outside prison camps were established where prisoners would live and be “hired out” for both public and private work. This worked so well that by the late 1890’s approximately one-third of the prisoners worked outside the prison. At these camps, which housed about 75 prisoners each, inmates enjoyed a relatively high degree of freedom with neither chains nor cells restricting them. However, “outside work” was a privilege, and the slightest infraction of the rules would immediately send a prisoner back behind prison walls. Not all the inmates were so violent, however, and one was downright liked by the guards and prisoners. At the age of 40, Pete Eitner was convicted of murder and sentenced to life in 1918. A model prisoner, he was assigned to tend to the prison turkeys and soon garnered the nickname of “Turkey Pete.” As he aged, he began to lose some of his mental facilities and when a man stopped one day to admire his turkeys, Eitner sold him the entire flock for 25 cents each. This ended his turkey tending days, but that was ok, because he soon fantasized a new “job” as the owner and administrator of the prison. 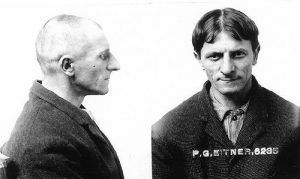 Prison officials humored him, “allowing” Eitner to “run” the prison from his cell. Fake checks were printed for him, with which he paid the prison expenses and payroll. He would also tell anyone who would listen that he had the coffee crop in Brazil one year, sold pink alligators, ships to the navy, and grasshopper legs to Fidel Castro. Empty of prisoners and standing as a silent sentinel to justice, the Powell County Museum and Arts Foundation obtained the building’s lease for use as a museum. After some restoration and the construction of a visitor’s center, the complex reopened in 1980, providing tours to more than 40,000 visitors each year. Listed on the National Registry of Historic Places, visitors to the museum can take guided or self-guided tours through several of the prison’s buildings, glimpsing the daily life of prison routines. 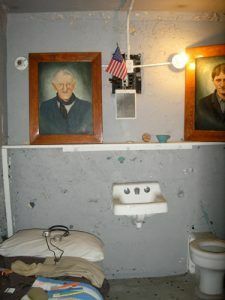 As visitors walk through the intimidating cell houses, Informational signs provide details of prison life where tourists will continue to see original schedules, rules, prisoner artwork, and even moldering blankets on many of the iron cots in its prison cells. More lurid displays show a “Prison Life” photo exhibit, contraband items and homemade weapons; and guns, shackles, and restraints utilized on the convicts. Evidence of a 1959 riot can be seen in the shattered bricks of the west tower, cramped blackout cells can be toured, and the gallows that once hanged capital offenders remain for those of us with a morbid curiosity. 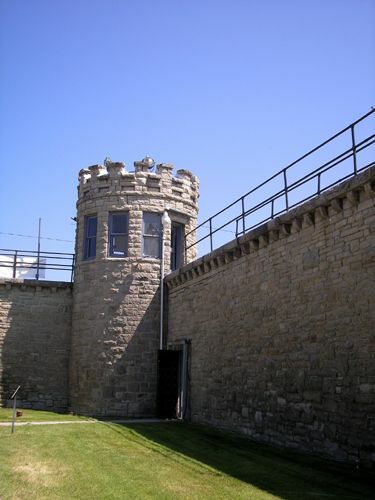 Though guards no longer occupy the turrets in each corner of “The Wall,” nor do the sounds of heavy cell doors sliding shut echo through the buildings, the tour can make even the most hardened visitor welcome their “release” into the grassy center yard. 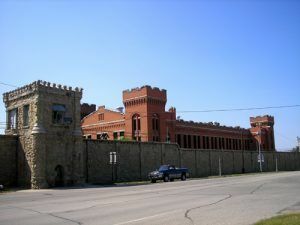 The Old Montana Prison Museum is just one of several museums sponsored by the Powell County Museum and Arts Foundation. In fact, Deer Lodge, Montana is home to more museums and historical collections than any other town in the Northwest. You can also see the Frontier Museum, Desert John’s Saloon Museum, and the Powell County Museum, all of which will transport you back to the era of cowboys and the Old West. The Montana Auto Museum features over 120 vintage vehicles, and Yesterday’s Playthings is Montana’s foremost doll and toy museum. Cottonwood City displays the Snowshoe Creek School and the Blood Cabin. 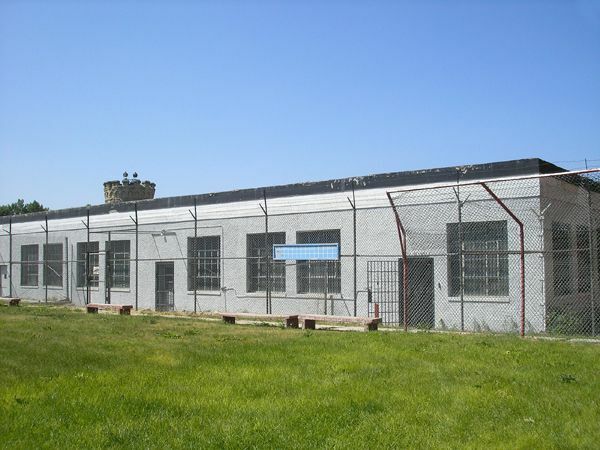 Two prisoners were hanged in this side yard of the Old Montana Prison.